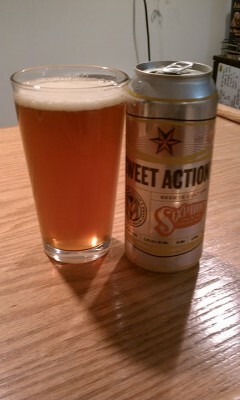 This is my second review this week of a Sixpoint beer, following Bengali Tiger a couple days ago. An aggressive pour produces about a quarter inch head of with foam made up of tight bubbles. After a minute, it's a thin film on the surface with a sturdy ring around the glass. The body is a nice orange hue with a bit of a chill haze to it. Aroma is what I guess I should have expected from the name of the beer. Malty sweetness with definite honey notes. Light grassy bitterness. Flavor expands on the aroma. Starts off with sweet honey-like malt. That stays a bit, but gives way to a surprising amount of citrusy hop flavors. Hops turn to grassy bitterness, which take a hold of my tongue for a little while. There is just a touch of piney hopes and a good amount of spiciness. Medium bodied with medium carbonation. It's neither thin, nor big and velvety. Not biting carbonation, but not the big bubbles either. Right in between, it compliments the beer well. Overall, this is quite a nice beer. I see this described as a Cream Ale and a Blonde Ale, but I'm not sure that it is either. 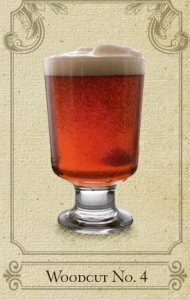 Not that style matters, but I would think this fits best as an amber ale. Super sessionable and easy to drink, you might find yourself wanting more than a four pack of this one. One of our members is now a brewery rep for Sixpoint. Adam was good enough to send me a sampler of the recently released cans from the brewery. This is my first review in what will be a four part series focused on Sixpoint. Thanks Adam! Bengali Tiger is the brewery's take on the American IPA. It comes in at 6.4% abv, 62 IBUs and 13 SRM. Here goes. This IPA pours a nice orange color with a slight chill haze. There is a stream of tiny bubbles rising up through the body, which helps to sustain the head. Head poured about an inch of beige foam. Thick and frothy, it had really good staying power. After a couple minutes, there was a thin film covering the surface along with thick lacing covering the sides of the glass. Lacing turns web-like as I empty the glass. Smells wonderful. Tropical and citrusy hops are highlighted by a sweet malt base. Pine and grapefruit along with a little bit of spiciness. The flavor really follows through from the aroma. Starts off sweet, with both the hops and the malt starting things off. Sweet malt combines with fruity hops. Hops stay for a bit while the malt fades into the background, showing orange, grapefruit, and a bit of piney flavor. All the sudden, it switches it up a bit and brings on a nice biting bitterness. The bitterness isn't really brash or overpowering. It pricks the tongue through the rest of this, well into the aftertaste. A bit of a return of the malt sweetness happens as the bitterness is fading. Mouthfeel is both creamy and prickly at the same time. 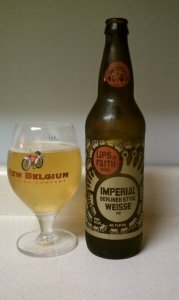 The body is nice and smooth, almost creamy, but at the same time, the carbonation is pricking at your tongue. Carbonation is fine, with tiny bubbles helping accentuate the bitterness of the hops. Finishes clean, even if the aftertaste stays in your mouth for almost a minute. This is a really nicely crafted IPA. Well balanced, but still highlights what an IPA should, the hops. Easy enough to drink that I'm upset I only have one. I would rank this among the best IPAs that the East Coast has to offer and overall it can hold it's own with the country's finest. Well worth checking out. I think once you give it a chance, you'll find yourself going back to the store for more. Thanks go out to the brewery for sending me this bottle this week. When I first found out about this beer coming out, I was cautiously optimistic. I really love the style, but one of the really redeeming qualities is how drinkable and sessionable they are with the refreshing qualities and the low alcohol. I was concerned that "Imperializing" the style would cut back at some of what I really loved about the beer. On the other hand, they could end up enriching the flavors I love too. Time to find out. A very small, slightly off white head formed when I poured the beer, as you can see from the picture. What is now left is just a thin ring of bubbles around the edge of the glass. The body is a light, clean, golden color. Smelling the brew brings back what I love about the style. Nice wheat base that just seems to intensify the tartness laying underneath. Some lactic aromas underneath. Sour apple. Flavor echoes what I got on the nose. Light wheat base rings through the entire time this is on my tongue, intensifying a bit towards the end. Tartness comes in right from up front, lasting for a couple seconds, before giving way to a bit of sweetness. Green apple is there, but very light. This one does drink much easier than you would expect from a 7% beer, but not quite as easily as a typical Berliner Weiss. I guess that's pretty much what I would expect, though it might drink easier than I expected. Very drinkable and pleasant beer. Being a lover of sour beers, and knowing what New Belgium can do with sours, I was hoping there might be a little more tartness here. It's on for the style, but the higher base seems to have made it a little more muted. That said, I'm enjoying this thoroughly and will be happily polishing off the bottle.